The HomeLink in your vehicle has 3buttons and you can store one programfor each button. 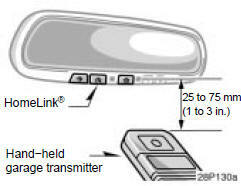 To ensure correct programing into theHomeLink , install a new battery in thehand−held transmitter prior to programming. 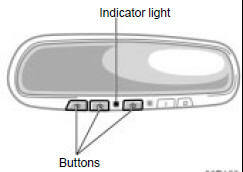 The battery side of the hand−held transmittermust be pointed away from theHomeLink during the programming process. For Canadian users, follow the procedurein “Programming an entrance gate/Programmingall devices in the Canadianmarket”. When registering the second and third signals,simply follow the steps listed below.If you erase the HomeLink memoryagain, any signals registered previouslywill be erased. 1. Decide which of 3 HomeLink buttonsyou want to program. 2. Place your hand−held garage transmitter25 to 75 mm (1 to 3 in.) away fromthe surface of the HomeLink . Keep the red indicator light on theHomeLink in view while programming. 3. Simultaneously press and hold thehand−held garage transmitter buttonalong with the selected HomeLink button.Do not release the buttons until step 4has been completed. 4. When the indicator light on theHomeLink changes from a slow to arapid flash, you can release both buttons. 5. Test the operation of the HomeLink bypressing the newly programmed button.If programming a garage door opener,check to see if the garage door opensand closes. If the garage door does not operate, identifyif your garage transmitter is of the“Rolling Code” type. Press and hold theprogrammed HomeLink button. The garagedoor has the rolling code feature ifthe indicator light (on the HomeLink )flashes rapidly and then remains lit after2 seconds. If your garage transmitter isthe “Rolling Code” type, proceed to theheading “Programming a rolling code system”. 6. Repeat steps 2 through 5 for each remainingHomeLink button to programanother device. If your device is “Rolling Code”equipped, it is necessary to followsteps 1 through 4 under the heading“Programming the HomeLink ” beforeproceeding with the steps listed below. 1. Locate the “training” button on the ceilingmounted garage door opener motor.The exact location and color of thebutton may vary by brand of garagedoor opener. Refer to the owner’sguide supplied by the garage dooropener manufacturer for the location ofthis “training” button. 2. Press the “training” button on the ceilingmounted garage door opener motor. Following this step, you have 30 secondsin which to initiate step 3 below. 3. Press and release the vehicle’s programmedHomeLink button twice. Thegarage door may open. If the doordoes open, the programming process iscomplete. If the door does not open,press and release the button a thirdtime. This third press and release willcomplete the programming process byopening the garage door. The ceiling mounted garage door openermotor should now recognize theHomeLink unit and be able activate thegarage door up/down. 4. Repeat steps 1 through 3 each remainingHomeLink button to programanother rolling code system. 1. Decide which of the 3 HomeLink buttonsyou want to program. 2. Place your hand−held gate/devicetransmitter 25 to 75 mm (1 to 3 in. )away from the surface of theHomeLink . Keep the indicator light on the HomeLink in view while programming. 3. Press and hold the selectedHomeLink button. 4. Continuously press and release (cycle)the hand−held gate/device transmitterbutton every two seconds until step 5is complete. 5. When the indicator light on theHomeLink changes from a slow to arapid flash, you can release both buttons. 6. Test the operation of the HomeLink bypressing the newly programmed button.Check to see if the gate/device operatescorrectly. 7. Repeat steps 1 through 6 for each remainingHomeLink button to programanother device. To program other devices such as homesecurity systems, home door locks orlighting, contact your authorized Toyotadealer for assistance. Individual HomeLink buttons cannot beerased, however, to reprogram a singlebutton, follow the procedure “Programmingthe HomeLink ”. To operate the HomeLink , press the appropriateHomeLink button to activate theprogrammed device. The HomeLink indicatorlight should come on. TheHomeLink continues to send the signalfor up to 20 seconds as long as the buttonis pressed. To erase all previously programmed codesat one time, press and hold down the 2outside buttons for 20 seconds until theindicator light flashes. If you sell your vehicle, be sure to erasethe programs stored in the HomeLink memory. When programming the HomeLink Universal Transceiver, you may beoperating a garage door or otherdevice. Make sure people and objectsare out of the way of the garagedoor or other device to preventpotential harm or damage. Do not use this HomeLink UniversalTransceiver with any garagedoor opener that lacks the safetystop and reverse feature as requiredby federal safety standards. (This includes any garage dooropener model manufactured beforeApril 1, 1982.) A garage door openerwhich cannot detect an object(signaling the door to stop and reverse),does not meet current federalsafety standards. Using a garagedoor opener without these featuresincreases risk of serious injury ordeath.